1 House and freehold land on Cook Street, St. John’s Newfoundland, and numbered Twenty-two and with the contents thereof. Also, all my money in my name at The Bank of Montreal, St. John’s, Nfld and at The Royal Bank of Canada, Main Branch, St. John’s, Nfld. Also, that piece of ground at Chamberlains, Newfoundland, willed to me by my brother George Samuel Chaytor, the deed of which is in my possession. 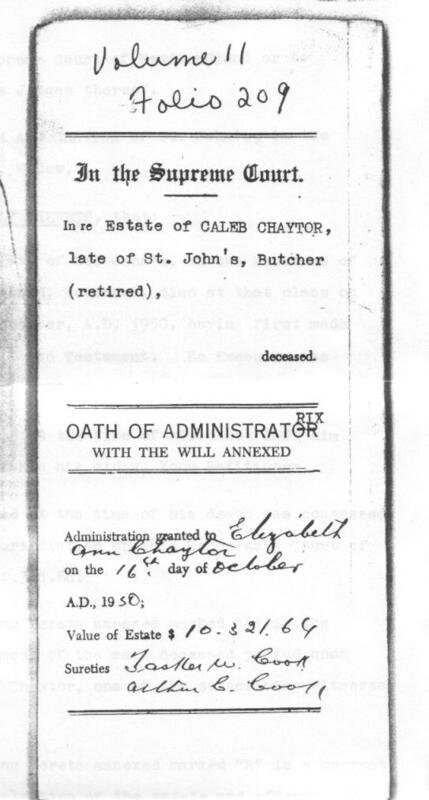 CALEB CHAYTOR, late of St. John’s, in the Province of Newfoundland, Butcher retired, deceased, died at that place on or about the 1st day of October, A.D. 1950, having first made and executed his last Will and Testament. No Executor was named in the said last Will and Testament. The said deceased at the time of his death left him surviving as sole next-of-kin his widow, Your Petitioner. The said deceased at the time of his death was posessed of property within the jurisdiction of this Honourable Court of probable value of $10, 321.64. 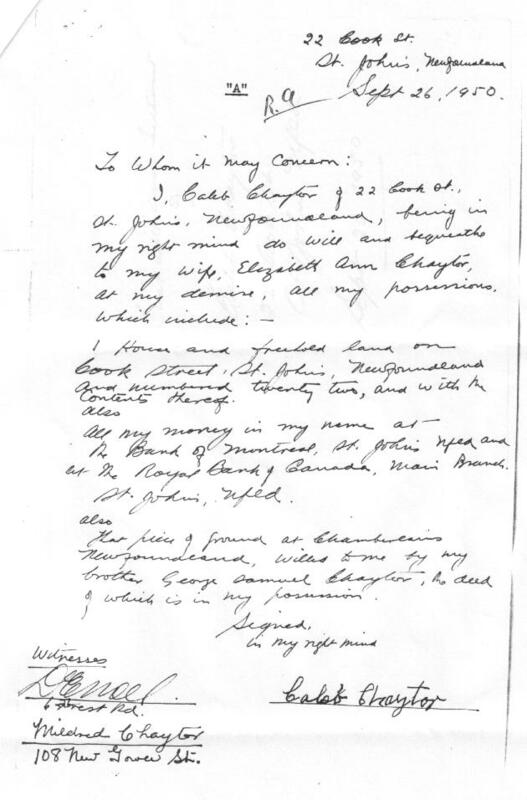 The paper-writing hereto annexed marked "A" is the said last Will and Testament of the said deceased proved upon the Affidavit of Mildred Chaytor, one of the subscribing witnesses thereto. The paper-writing hereto annexed marked “B” is a correct and true Inventory and valuation of the estate and effects of the said deceased at the time of his death, so far as Your Petitioner can at present ascertain. Neither Probate of any Will nor Letters of Administration to the Estate of the said deceased have been applied for by or granted to any person. Dated at St. John’s, Newfoundland, this 16th day of October, A.D. 1950. Administration was granted to Elizabeth Ann Chaytor on the 16th day of October A.D., 1950.